The Trafalgar Studios are two venues housed within what was London's Whitehall Theatre. The building itself is Grade II listed, and is an excellent example of simple, unadorned Art Deco style. The interior, however, is spectacular, with complex, cubist designs and sweeping curves of moulding and ironwork. Set among the great palaces that house the administrative machinery of British government, the Trafalgar Studios seat 380 and 80 people respectively and act as one of the London bases for the RSC who have been leading a somewhat nomadic existence since they vacated the Barbican Theatre. What are the best dining options near Trafalgar Studios London? Trafalgar Studios gyms, sporting activities, health & beauty and fitness. The best pubs near London Trafalgar Studios. 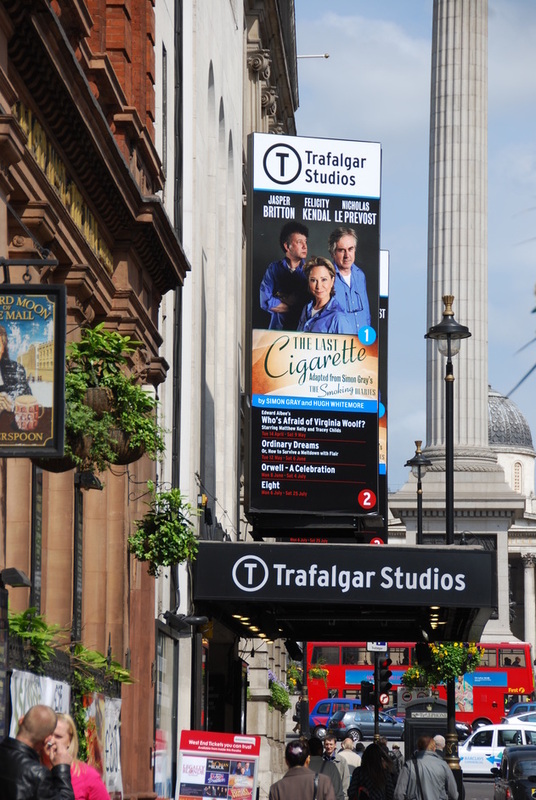 Trafalgar Studios clubs, bars, cabaret nights, casinos and interesting nightlife. Where to have your meeting, conference, exhibition, private dining or training course near Trafalgar Studios. From cheap budget hotels to luxury 5 star hotels see our deals for Trafalgar Studios hotels, including The Grand at Trafalgar Square from 77% off.